Corey Gault breaks away from a tackle during Collingwood's first round win over North Ballarat at Victoria Park. Photo: Shane Barrie. Collingwood confirms it has delisted key position youngster Corey Gault as part of its Second List Lodgement to the AFL. Draft with selection No. 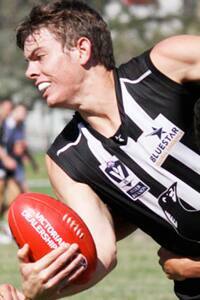 65 in the 2011 National Draft, Gault, 21, played 14 VFL games in his second season at the club. The West Australian was used as a key position player at either end of the ground.